As a lengthy legislative investigation of University of Texas System Regent Wallace Hall appears to be nearing an end, the 2014 elections and developments at the University of Texas System are adding new twists. 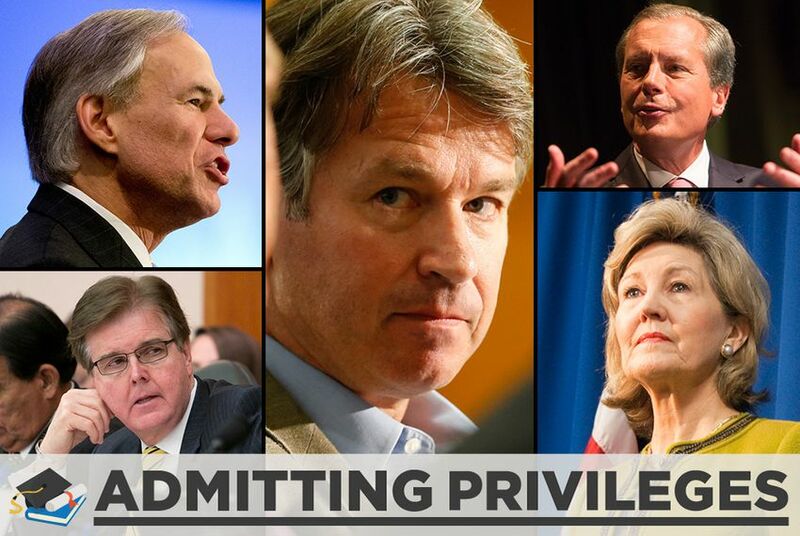 Admitting Privileges is a three-part series on the debate over lawmakers and the University of Texas at Austin's admissions process. Our coverage also includes a timeline on the tensions in the UT system. You can read more higher education coverage here or subscribe to our education newsletter here. During a special session of the Texas Legislature more than a year ago, a resolution calling for the impeachment of Wallace Hall, a University of Texas System regent, was filed in the House — and according to the leadership, it could have passed. Straus, R-San Antonio, expanded the authority of the House Select Committee on Transparency so that its members could investigate governor appointees. The panel soon started an investigation of Hall, who had been criticized for extensively investigating the administration at the University of Texas at Austin. Hall has said he was only fulfilling his oversight responsibilities as a regent. The committee has determined that grounds exist to impeach Hall and is working on drafting articles of impeachment. But as this lengthy phase appears to be nearing an end, the state’s shifting political landscape and developments at the UT system are adding new twists. The state is electing a new governor and lieutenant governor. And many recently nominated Republican candidates, particularly in the Senate, who are favored to win those races, could be more attuned to Hall’s perspective than their predecessors. Since his appointment in 2011, Hall, who declined to comment for this article, has spent most of his time investigating UT-Austin and its president, Bill Powers. After the House committee’s investigation began, Hall revealed through his lawyers some of the matters he was looking into and leveled multiple allegations against the university administration, most notably that there was “secret favoritism” for politically connected applicants in the admissions process. State Sen. Dan Patrick of Houston, the Republican candidate for lieutenant governor, said the lawmakers' actions might need a closer look. Patrick defeated Lt. Gov. David Dewhurst, the incumbent, in the Republican primary runoff in May. Patrick’s campaign received $25,000 from Hall. Patrick is the front-runner in the general election, in which he will face state Sen. Leticia Van de Putte, D-San Antonio. As president for the Senate, the lieutenant governor could play a significant role if the House approves any articles of impeachment that the transparency committee moves forward. The trial would be held in the Senate, at a date and time determined by the lieutenant governor, who would also wield significant influence over the rules governing the proceedings. Given the changing of the guard, a Senate trial held next year could look significantly different from one held sooner. The question of whether that flagship’s admissions processes are too prone to political leaders’ influence — an issue first raised by Hall — is about to get a thorough vetting. Last week, Francisco Cigarroa, the chancellor of the UT system, announced his intention to commission an external investigation of the issue. A previous review, which was limited in scope, found evidence that lawmakers’ letters impacted admissions decisions but no evidence that there waswrongdoing or systematic favoritism. Even if the system’s examination of the admissions process validates Hall’s concerns, it is unclear if that will alter the course of the transparency committee’s investigation. Hall has refused — in lieu of a subpoena, which was not forthcoming — to appear before the committee. The threshold for impeachable offenses in Texas is significantly lower than it is in Washington. Abbott faces state Sen. Wendy Davis, D-Fort Worth, in November. Three UT System regents’ terms are up in February 2015, giving the next governor an opportunity to set a tone on the board soon after Inauguration Day. In Straus’ view, new leadership will have a calming effect. “We’re going to get back to building up our institutions of higher education and being proponents of research and creating more tier-one universities, which was a big part of the conversation before this unfortunate incident with Mr. Hall and some of his friends,” Straus said. Disclosure: The University of Texas at Austin and Southern Methodist University are corporate sponsors of The Texas Tribune. A complete list of Texas Tribune donors and sponsors can be viewed here.